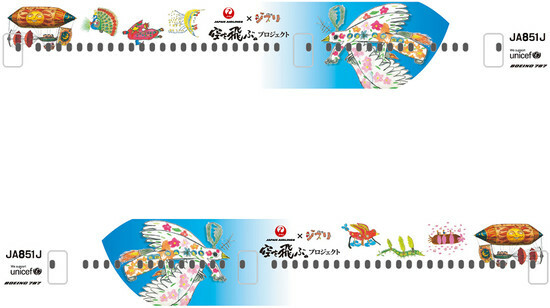 Japan Airlines (JAL) and Studio Ghibli have unveiled the Boeing 787 jetliner decorated by Ghibli founder Hiyao Miyazaki and seven children, who were the winners of a children’s art contest at Tokyo’s Haneda Airport. 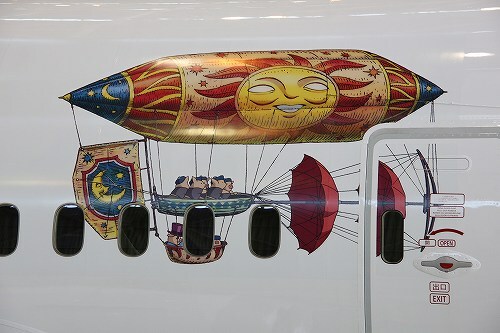 The collaboration between Ghibli and JAL was made after the Ghibli film Porco Rosso and the art competition took place from 2007 to 2008 to decorate the new Boeing 787 Dreamliner. However, Boeing delayed the delivery of the aircraft by five years and JAL filed for bankruptcy in 2010, the airline therefore had to wait until now to unveil the designs, which were part of its Sora o Tobu (Fly the Skies) Project. As part of its Fly the Skies Project, JAL flights will screen Porco Rosso and the rare 2002 animated short by Miyazaki, Kūsō no Sora Tobu Kikai-tachi (The Machines that Fly the Skies of Dreams). The short is not only directed Miyazaki, but is also narrated by him.